It is commonly active in the 10–20 mg range, taken orally or nasally and highly dose-sensitive. Insufflating (snorting) requires a much lower dose, typically not exceeding 10 mg, but this method of consumption elicits an extremely painful sensation in the nasal cavity for 10 minutes or so. Shulgin classified 2C-E as a member of the "Magical Half-Dozen" in his book PiHKAL: A Chemical Love Story. 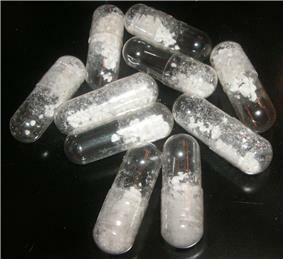 Many have reported that the general effects of 2C-E are similar to those of the other psychedelic phenethylamines, but far more intense. Vivid visuals similar to those experienced while under the influence of LSD are common, and many reports indicate that the effects of this particular chemical may be overly intense for those not well experienced with psychedelics. The total duration of 2C-E's effects is generally between six and ten hours for an average dose, with the plateau lasting between three and six hours. :517 For such a dose, the onset of effects takes approximately twenty to ninety minutes and perception may be somewhat altered for up to a day after ingestion. In extreme cases the duration of effects has exceeded twenty-four hours, with plateaus exceeding ten hours in length and an onset of effects within the first five minutes after the ingestion of the drug. The concurrent use of SSRIs generally has a synergistic effect upon both the intensity and duration of the effects of 2C-E during their plateau stage. 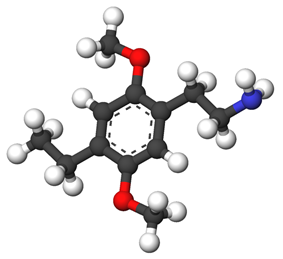 2C-E is also thought to overpower certain other drugs, though research is minimal, mostly coming from PiHKAL (Alexander and Ann Shulgin's research), assumptions or comparison with the well researched and very closely related 2C-B, and the subjective effects that its users have experienced. "Let it [2C-E] rest as being a difficult and worthwhile material." At doses approximating or exceeding twenty to twenty-five milligrams, 2C-E can produce intensely colorful, highly complex, moving, fractal-like patterning, Persian carpet-type visuals, three-dimensional visual effects, and, sometimes, visual patterning strongly resembling biological structures, such as vines, tentacles, and even eyeballs. The visual distortions produced by 2C-E are comparable in some respects to those produced by mescaline, and some users of both drugs have reported that the visual effects of 2C-E are more emphatic of color than are mescaline's corresponding effects, while mescaline's visuals are more emphatic of geometric structure. Large doses are known to produce much darker "heavy" experiences where users often experience the feeling of falling and/or of death. 2C-E also seems to make some users more likely to confront personal issues than LSD, and comparisons are often made between the two. However, 2C-E's chemical structure is fairly different from that of LSD, and while the both are serotonin agonists, 2C-E's body load is a highly unusual one. Several users have described it, roughly, as a "profound feeling of general discomfort". It is sometimes characterized by urges to shift the position of one's body, strong nausea at high doses leading often to vomiting, itching, prolonged tensing of unusual combinations of muscle groups which can occur without the user's knowledge over a long period of time, diarrhea, and an accompanying feeling of "disconnection from one's digestive tract". Larger doses can also cause feelings of extreme fatigue despite being well rested. 2C-E's distortion of sounds is also quite profound, and includes the flanging of sounds, echoing, pitch shifting, and the perceived synthesis of new sounds not derived from one's immediate environment, such as scraping, drilling, and popping. Again, many of the more unusual distortions of sound are only experienced after the ingestion (or, rarely, insufflation) of a higher dose. Insufflation greatly increases the potency of the drug, and should be used with even more caution (The related compound 2-C-T-7 has caused death at 20–35 mg insufflated, a strong dose, but there are reports of 120 mg IV doses of 2C-E). "Here is another of the magical half-dozen. The range is purposefully broad. At 10 milligrams there have been some pretty rich +++[nb 1] experiences, and yet I have had the report from one young lady of a 30 milligram trial that was very frightening. My first experience with 2C-E was really profound, and it is the substance of a chapter within the story. Several people have said, about 2C-E, "I don't think I like it, since it isn't that much fun. But I intend to explore it again." There is something here that will reward the experimenter. Someday, the full character of 2C-E will be understood, but for the moment, let it rest as being a difficult and worth-while material. A very much worth-while material." Alexander Shulgin, who first synthesized the 2C-X chemicals, created a list of the "magical half dozen" of phenethylamines which felt were the most "magical" or useful. The list includes 2C-E, 2C-B, 2C-T-7, 2C-T-2, DOM, and Mescaline. Like all psychedelics, 2C-E produces a very altered state of consciousness. One unusual side of 2C-E's effects is that some users have reported experiencing "relatively normal thought processes" even while experiencing visual and auditory distortions. These users suggest, in other words, that 2C-E doesn't impair judgment as deeply as do many other psychedelics with otherwise-similar effects; however, these claims have not been tested in any controlled study. The wide difference between different users' accounts of the intensity, duration, and nature of the effects of 2C-E can be largely attributed to users' highly varying dosage of the drug. Resources like Erowid suggest that an average dose of 2C-E might be between ten and fifteen milligrams, and Erowid gives the highest "heavy" dose as twenty-five milligrams. Elsewhere on the Internet, and especially in various forums for users of psychedelics, users have reported taking up to between seventy-five and one hundred milligrams of 2C-E, and the ensuing experiences have sometimes been extremely intense and very long (in some cases upwards of twenty-four hours in duration) or in other cases the experiences were relatively mild with only a slightly longer duration. . However, no experienced user of 2C-E has recommended doses this large for any newcomer; an appropriate starting dose might be between seven and twenty milligrams for someone intending to consume 2C-E recreationally, depending on how experienced the new user is with similar drugs. Little is known about the long-term effects of its use. Importantly, 2C-E is an extremely uncommon substance with a very short history of human use, and it is possible that lasting negative effects could be produced by any dose. It is thought that 2C-E binds to the 5-HT2A receptor, causing its effects. Heavy usage for long periods of time has been reported to cause HPPD. HPPD is a condition where after the ingestion of a psychedelic substance, the visual effects of the substance are still visible after the effects of the drug have worn off. At least one death has been attributed to a 2C-E overdose. In Queensland, 2C-E was added to the 'Dangerous Drugs' list of the 'Drugs Misuse Act 1986' by the 'Drugs Misuse Amendment Act 2008'. Making it illegal to produce, supply or possess. As of October 2015 2C-E is a controlled substance in China. 2C-E is added to the list of Schedule B controlled substances. 2C-E is a Anlage I controlled drug. Sveriges riksdags health ministry Statens folkhälsoinstitut classified 2C-E as "health hazard" under the act Lagen om förbud mot vissa hälsofarliga varor (translated Act on the Prohibition of Certain Goods Dangerous to Health) as of Oct 1, 2004, in their regulation SFS 2004:696 listed as 2,5-dimetoxi-4-etylfenetylamin (2C-E), making it illegal to sell or possess. 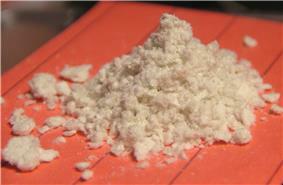 In the United Kingdom, 2C-E is a Class A controlled substance. The UK has the strictest laws in the EU on designer drugs. The Misuse Of Drugs Act was amended in 2002 to include a "catch most" clause outlawing every drug, and possible future drug, from the LSD (ergoline) and MDMA (phenethylamine) chemical families (including 2C-E). The amendment is a near verbatim quote from the books of the American biochemist Alexander Shulgin, who obtained a PhD from the University of California, Berkeley. Dr. Shulgin, a former research chemist at the Dow Chemical Company, re-discovered the synthesis for MDMA in 1976 and published the syntheses for more than 200 phenethylamine compounds of his own invention, and 55 tryptamine compounds many of which were also his own invention. The Shulgins were motivated to release the synthesis information as a way to protect the public's access to information about psychedelic compounds, a goal Alexander Shulgin has noted many times. ^ Shulgin's +/- rating scale, per PiHKAL. See References below. Quoting: "Plus Three (+++) = Not only are the chronology and the nature of a drug's action quite clear, but ignoring its action is no longer an option. The subject is totally engaged in the experience, for better or worse." ^ Shulgin, Alexander T.; Manning, Tania; Daley, Paul F. (2011). The Shulgin Index: Volume 1 (First ed.). Berkeley, CA: Transform Press. ^ Shulgin, Alexander T; Shulgin, Ann (1991). PiHKAL: A Chemical Love Story (1st ed., 7th printing ed.). Berkeley, CA: Transform Press. ^ Fire, Erowid; Earth, Erowid. "Erowid 2C-E Vault: Effects". Erowid.org. Retrieved 29 June 2014. ^ Pham, Sherisse (18 March 2011). "Man Arrested in Mass Drug Overdose That Killed 1 Teen and Left 10 People Hospitalized". ABC World News. Retrieved 29 June 2014.